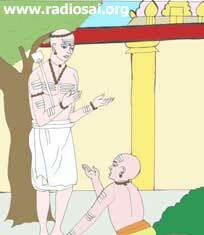 In South India, in the Tamil country, there was a certain Adigal or Dasa, in a village, Thangalur by name. He had heard of the spiritual grandeur of Saint Appar and developed great admiration for him. So he built resthouses in his name and named his children after him so that they might grow up in the halo of his glory. He donated lands and houses, all in the name of the Saint he had not seen. See how faith preceded experience here. There are others who require experience before they fix their faith. The first path is more thrilling and lasting. 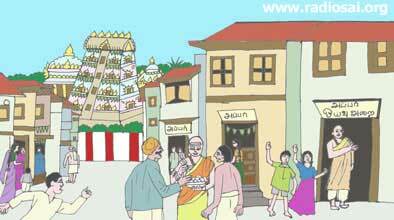 Well, one day by chance Appar himself walked into Thangalur for he had missed his way and had to deviate. He noticed everywhere in the town Appar Resthouses and Appar Charities, and wondered how his name had preceded him. 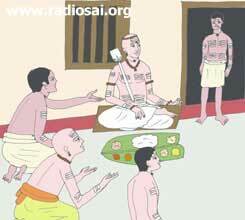 Then Adigal ran forward to His Guru and took him home and prepared a grand feast for him. When his eldest son went to his garden to cut a few plantain leaves for the dinner, a snake bit him and he died on the spot. Adigal however, was not affected in the least. He covered up the corpse, heaping dry leaves upon it and proceeded with the formalities of hospitality for the long-sought Guru.